Finding a universal remote can be a trial, largely because the only company making a good one that works with all the major set-top boxes, TVs, and game consoles, also charges around $150 for the experience. Earlier this year a $400 challenger became available, and it was an extremely bad buy. It was overpriced, its HDMI hub didn’t support HDR, and—okay yeah I think that’s all you need to make a universal remote completely worthless. 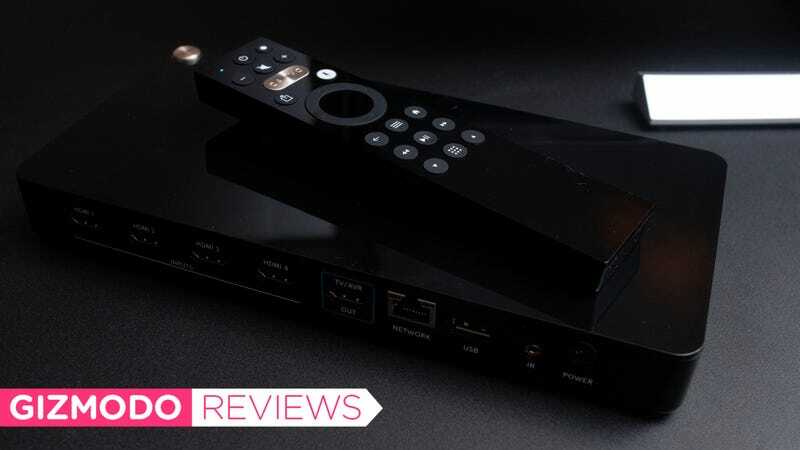 You don’t have to support HDR if you’re going to be cheap—but you sure as heck better if you’re two and a half times the price of the next best remote, the Logitech Harmony Companion. But now the company behind the pricey solution, Caavo, is back with a new product, Control Center, and not only has it cut the price to $100, but it’s also added HDR. This is finally a universal remote to be excited about. 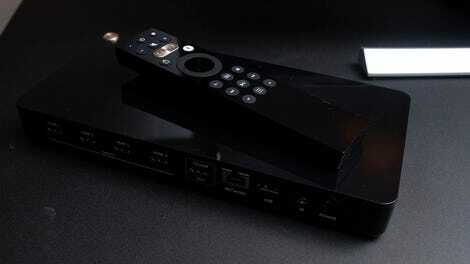 A 4x1 HDMI Switch and remote control. $100 is a lot, it only has 4 HDMI ports, and DolbyVision is not yet supported. But I guess I’m someone who gets excited about universal remotes. With a whole lot of things plugged into the back of my TV, including two different set-top boxes, I’m always in search of a good solution. The fewer remotes I juggle just to catch up on Bob’s Burgers the better. But Caavo functions a little differently than other remotes, and I’ll admit that its methodology could be a deal breaker. Most remotes function by programming themselves with an IR code from your various devices. It’s all stored on the remote, and if it’s a Logitech, the current gold standard for universal remotes, it requires a USB cable and a computer to set everything up properly. The Caavo Control Center does things differently. First, it’s not just a remote but an HDMI switch. You plug 4 inputs and an ethernet cable into the Control Center, then you connect it to your TV by another HDMI cable. The original did this well. It was a huge, gorgeous box with a nice wooden lid, and 8 HDMI ports that could handle 4K, but not HDR. The new box is much smaller—just 4 HDMI ports—and the nice wood finish is all gone. This $100 product is definitely cheaper looking and feeling than its $400 predecessor. But that isn’t a bad thing! It still does what it needs to do. So after you’ve plugged it in and powered it on you’ll then be ushered through a fairly painless process on the Control Center. It will identify speakers you have plugged in, what kind of TV you’re using, and will note every single product plugged in. It quickly knew I had an Nvidia Shield, Xbox One, Apple TV, and PS4 plugged in, and when I switched two of those out for the PS3 and the Xbox 360, it was a cinch to re-ID them and have them properly labeled on the Caavo. Besides the price and hardware, the Control Center isn’t too different, functionally, from the previous generation. There’s an option to navigate to specific outputs, or to specific apps, and you can tell it which output to open apps on, so if you prefer Netflix on the Shield and Amazon Prime on the Xbox One it’s possible and easy to open. The Control Center also supports Google Assistant and Amazon Alexa, should you want to control things by voice. But for me, the most appealing aspects of the Control Center are its price ($100 is one-quarter of the original Caavo, and cheaper than something similarly complex like the $150 Logitech Companion) and its ability to function as an HDMI switch for my most commonly used devices. Nowadays we have a lot of things we have to plug into our TVs—set-top boxes, game consoles, retro game consoles, and even computers—but the back of the modern TVs can be pretty sparse when it comes to HDMI inputs. My LG OLED only has four, and the Sony TV I’m currently reviewing has a paltry three. I have to make decisions about what gets plugged in and what I have to blindly switch cables with when I’m ready to use it. But for the price of a solid HDMI switch that supports HDR and 4K, I can get a really great universal remote that handles my primary devices, leaving other HDMI ports open for less used stuff like my SNES and my PS3. That’s a deal to me. The support for voice assistants and the nice app navigation are nice bonuses. If you’ve only got four things you need to plug into your TV and use them regularly, then it’s pretty simple: the Caavo Control Center is the most pain-free option available. It’s quick, easy to use, and smarter than just about anything else in my TV cabinet. It’s one-quarter the price of the previous Caavo, and $50 less than it’s closest Logitech competitor. Yes, the Logitech 650 exists and is under $40, but it doesn’t work with the PS4, PS3, or any other product without an IR blaster. The Control Center works exactly as intended. It doesn’t control lights currently, and Caavo has not said if it plans to add that feature. It also doesn’t support DolbyVision, but that is coming in a near future update.